Happy Hamby Campers: Starry, sari nights! Our recent first night in the camper trailer prompted Erin to buy a swag. She'd been thinking about the purchase for a while, so it wasn't a reaction against the cramped conditions - or the fact that Bandit stood on her face during the night! In researching the available styles of swag at a few local camping stores, we also checked various sale-priced items. 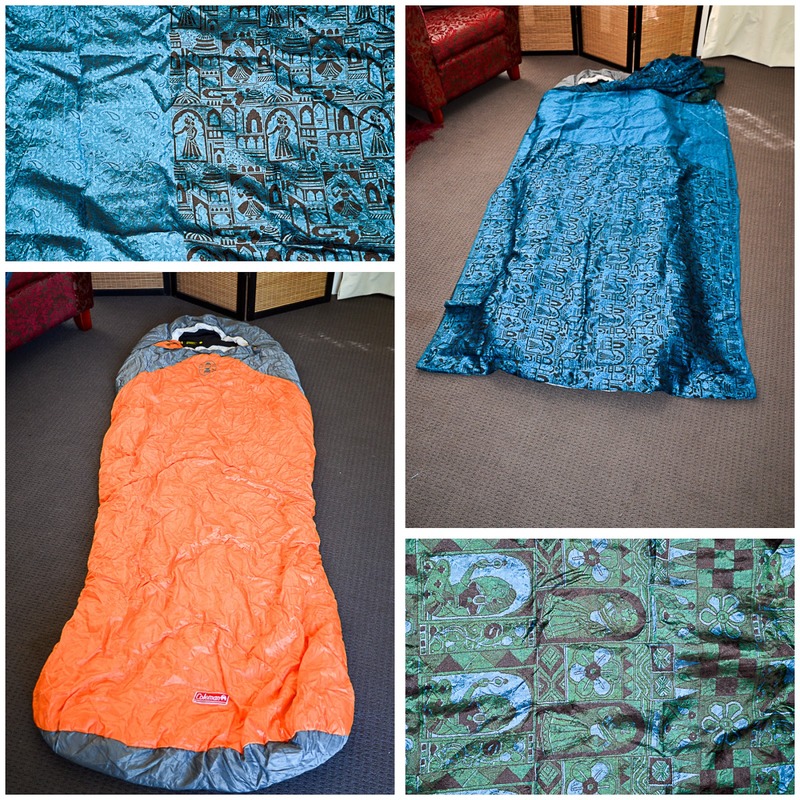 Anaconda had some sleeping bag liners - including a silk blend. Erin seemed to be considering them, so I reminded her of the sari silk she'd purchased for a different project. Over the weekend, three lengths of sari silk were retrieved from the infamous stash and I've now crafted two large silk sleeping bags. 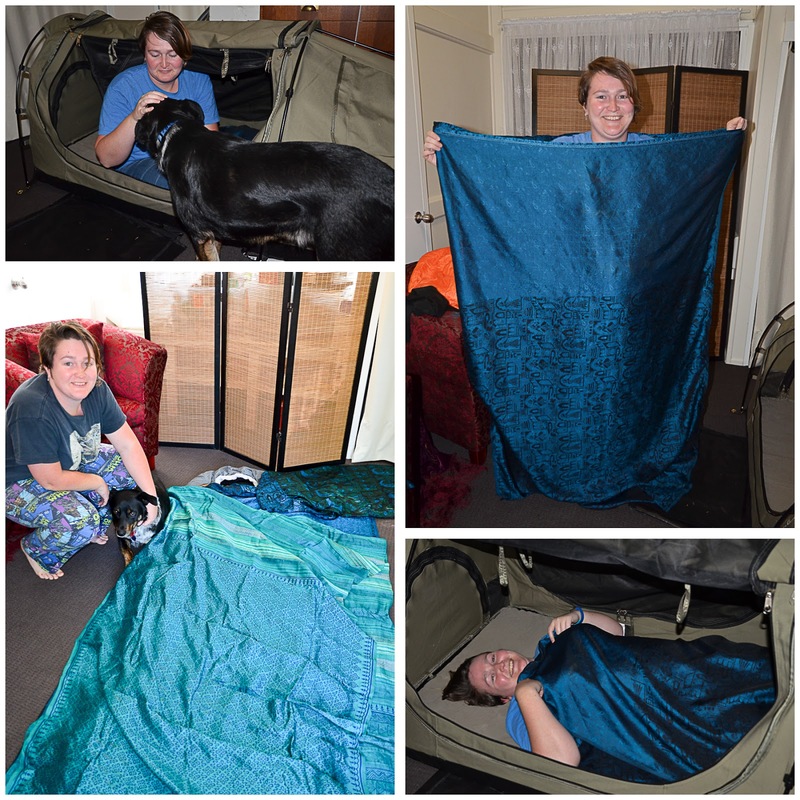 Although my initial thought was to line Erin's sleeping bag, she is not sure she'll continue to use it now we are based in Queensland. 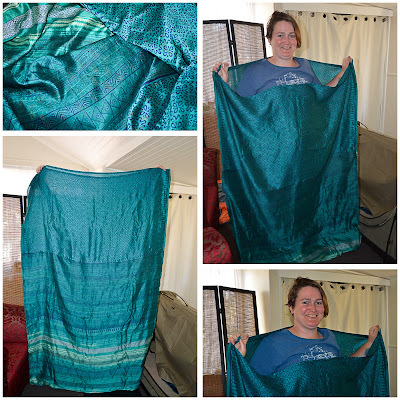 My Plan B was to create wide bags by using the full width of the fabric lengths. Erin tested one bag last night in her new swag (set up inside). She can be a restless sleeper, so found the extra roomy bag very comfortable - and didn't need any additional covering. It was quite warm here overnight but if she does need another layer, she can unzip her sleeping bag and use it as a doona. The sari silk was originally purchased to make special pillowcases and there was plenty left for those. I've made two so far, one for each of the sleeping bags. (If a swag is silk-lined, does that count as glamping)?! Erin paid approximately $13.00 for each sari piece. The fabric isn't exactly the same width or length but I think it is fair to cost a sleeping bag and co-ordinating pillowcase at $13.00. (A full silk, plain coloured sleeping bag liner was on sale at Kathmandu for just under $90, discounted from $149.98)! Construction of the bags was simple. I hemmed the short ends and sewed the bags with the right side of the fabric to the inside. The non-door side seam is sewn along the full length. The side seam adjacent the door was left open for the top third, to allow easier access. Both side seams were double-stitched. There was no need for overlocking as the seams incorporate the selvedges of the fabric. (One bag measures 116xm x 192cm and the other is 112cm x 183cm). 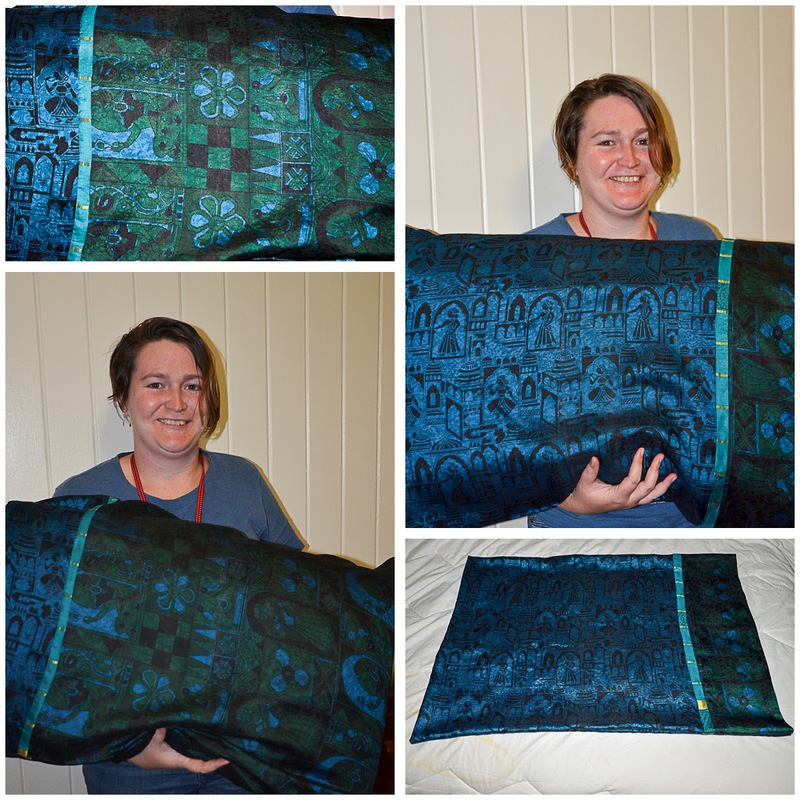 I used the burrito method to make these pillowcases. (There are a number of free tutorials on YouTube. I like one by Crafty Gemini). No overlocking is necessary, which is great as I wasn't sufficiently motivated to unpack mine and set it up!